Looks like things are going well over in Taiwan, as HTC has reported record-breaking Q2 results this morning. In fact, the company sold 12.1 million units in the second quarter totaling a 123.7 percent year-over-year growth rate. After Q2 taxes, that brings YOY growth to 102.9 percent. If you aren’t good with percentages, that’s huge. In terms of quarterly growth, HTC is up 24.8 percent from the first quarter. A solid chunk of this can be attributed to China, which was HTC’s “standout” market. Entry-level models such as the Wildfire S, Salsa, and ChaCha (a.k.a. 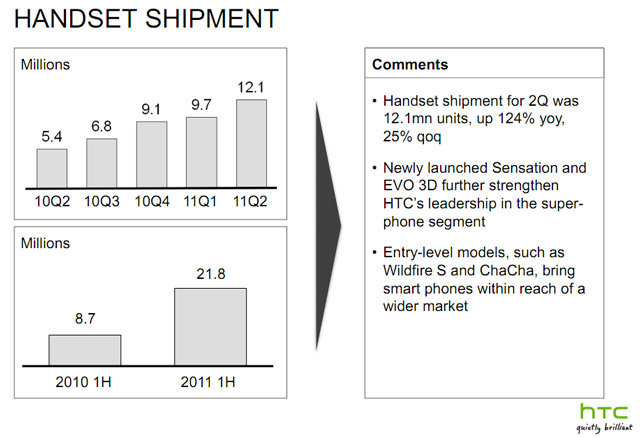 AT&T’s Status Facebook phone) also made an impact by broadening HTC’s portfolio. Of course, the Sensation and the Evo 3D certainly did their part, as well. As I said earlier, HTC’s on a roll. Unfortunately, Apple wants to be one massive roadblock in the company’s path to success. Apple recently won over the judge after requesting an ITC import ban on HTC products. This could certainly hurt HTC, although the Taiwanese company has definitely put forth an effort to protect itself where patents are concerned. The $300 million it spent picking up S3 graphics certainly beefed up its portfolio by 235 patents (and patent applications) to be exact. But there’s no telling whether or not Apple will trip up HTC as this legal tussle moves forward. Estimated projections for next quarter don’t stray too far from the growth the company’s seen during Q2. HTC expects to ship 13.5 million units, which would represent 98 percent growth year over year. If all goes as planned, that’s a net revenue of $4.8 billion next quarter alone.